You are here / South Africa Travel News / Activities / The Pickle Pot – Anyone for a trip into the country? Now reading: The Pickle Pot – Anyone for a trip into the country? The Pickle Pot – Anyone for a trip into the country? 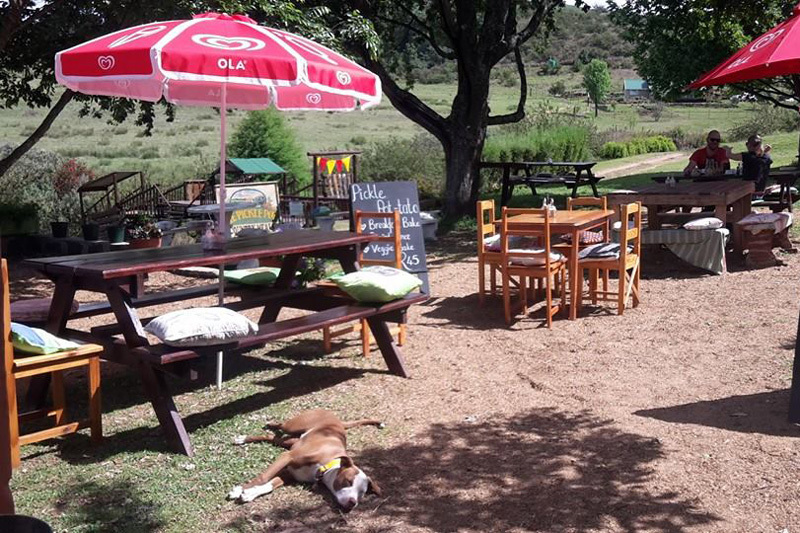 Situated just outside the small farming town of Boston in the beautiful KwaZulu-Natal Midlands the Pickle Pot is a good 45 minutes drive from Pietermaritzburg and is the furtherest venue south on the popular Midlands Meander. Advertised as a locality that sports a family restaurant, a farm stall, craft centre, an adventure playground for the kiddies and an indigenous forest walk to name but a few attractions, I decided that a visit was an absolute must. Unfortunately, a recent Sunday afternoon social round with friends Mary-Anne and Curran proved to be something of an anti-climax. Our first port of call was the craft centre and although there were some interesting trinkets on display, there wasn’t anyone on hand to assist us – astonishing to say the least! We then made our way toward the restaurant, the main reason for our afternoon visit. Although a bit on the small side, the restaurant (complete with stone floors) is quaint and has an old world feel to it, something that always relaxes perfect melancholic types like yours truly. Our waitress greeted us with a friendly smile and promptly took our drinks orders, which consisted of a strawberry milkshake, hot chocolate and a plunger coffee. The main menu consists of an array of omelettes, traditional breakfasts such as scrambled egg on toast, pancakes, curries, burgers, toasted sandwiches, pies, pastas, soups and other tasty offerings – undoubtedly a selection likely to satisfy almost any palate. Mary-Anne decided on a lamb curry (R60) while Curran and myself were more conservative in our choices, opting for a cheese burger (R35) and chicken and mayonnaise toasted sandwich (R35, including chips) respectively. Our orders arrived in good time and since we were all rather hungry we quickly began to tuck in. We all agreed that the food was tasty and the portions generous, although Curran felt his burger should have come with chips – something which I, and I’m sure 99 per cent of the rest of humanity, am in full agreement with. Full stomachs meant that we all decided to pass up dessert but we were in no hurry to leave, as we had not yet had a look at the farm stall complete with its vast stock of bottled pickles. I decided on the mild and spicy chutney flavour, although parting with R22 for a 320g jar perhaps didn’t equate into the best deal going. We had originally planned to go for a long walk after lunch to take in some of the beautiful surroundings and breathe in some fresh country air, but it was raining and so we had no option but to make an early journey home. Reflecting on our experience, we decided that while we were impressed with the friendliness of the Pickle Pot staff and the presentation and taste of our food, having no one on hand to assist us at the craft shop was unprofessional and where have you heard of a burger that doesn’t come with chips. A visit to the Pickle Pot, at least for out of towners who enjoy a walk in the country, is probably only going to be worthwhile if the skies are clear and the company good. However, if you are close by and all you are looking for is a hearty country cooked meal, then this is a venue that could well be worth your visit.